MD in Cardiology is a 3- year full- time postgraduate program in medicine. Cardiology is a medical speciality dealing with disorders of the heart. The aim of this course is diagnosis and treatment of congenital heart defects, coronary artery diseases, heart failure, valvular heart diseases and electrophysiology. The career is job- oriented in nature and offers many jobs opportunities for successful postgraduates. Medical practitioners dealing with heart disorders are called Cardiologists. They analyse and tackle cardiovascular or circulatory illnesses and disorders related to arteries, blood vessels and veins. These illnesses may include problems caused by restricted circulation due to narrowing of the arteries, problems in the heart valves, damage to muscle tissues, and disorders of the pericardium. Eligibility An M.B.B.S or equivalent degree in science. Compiled here is a list of the top institutes in India offering the course along with their respective locations and fees charged by each. Candidates wishing to pursue the course need to have attained the 10+2 qualification with Biology, Chemistry and Physics as main subjects. Additionally, such candidates need to appear for and qualify the relevant competitive entrance exam and pursue an MCI- recognized MBBS (Bachelor of Medicine and Bachelor of Surgery) which is a 5 and a half year- long course and includes a 1-year long compulsory rotating internship. The internship needs to be completed by such candidates by 31st March of the admission year. Most of the reputed medical institutes of the country admit students on the basis of their NEET PG entrance exam scores. However, there are a few institutes which conduct their own entrance exams for the PG admissions. One can apply via any of online and offline modes. Generally, the entrance exam is conducted all over the country in both offline and online modes, around the year, from December to June. Candidates need to be up- to- date with the guidelines for application and last dates of form submission. In a typical 3-year cardiology course, studies combine research with lab exercises and clinical experiences wherein students work directly with patients in actual healthcare settings. The skills they are trained in acquiring include performing heart catheterizations and EKG tests. Students pursuing the course need to pass a certification exam in cardiology before they can begin working in the field. Before starting to practise, they need to complete graduation from an accredited medical school, residency, attain a satisfactory Internal Medicine Board Certification exam score, undergo stages of program interview, personal statement, curriculum vitae, medical school transcripts, and letters of recommendation. Patient care, lab work, and research opportunities are also included as prerequisites. 4 Assist in various interventions including valvuloplasty, coronary and congenital interventions. Due to the current increase in heart conditions, the need for more super specialty heart care centres is increasing along with career avenues for skilled cardiologists in the country. 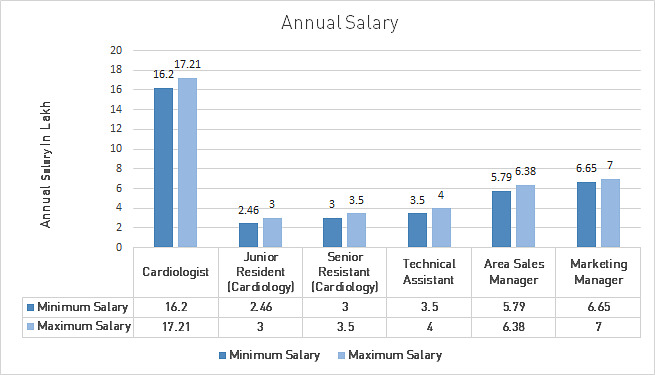 Skilled heart healthcare specialists are needed in both government and private hospitals. Aside from working as practising doctors, cardiologists can also work as Lecturers in medical colleges. Cardiologist work in hospitals on any of weekly, hourly and monthly basis. They may even choose to open their own health care centres, or work in research areas in reputed hospitals. They work as doctors in hospitals in cardiology departments, cardiac rehabilitation centres, clinics, and defence hospitals, or become scientists in cardiology. Although cardiology is a specialised area in medical science, several sub-specialties have developed within this field. For instance, Nuclear Cardiologists focus on the pumping functions of the hear, Electro Physiologists specialize in the electrical functions of the heart, Interventional Cardiologists perform invasive procedures such as stent insertion and angioplasty. Yet another class of cardiologists specialises in areas such as Paediatric Cardiology for treatment of abnormalities and diseases of the heart in children who are still in utero. Listed here are some of the popular job positions offered to successful postgraduates of the discipline with the corresponding job descriptions and salaries offered.